﻿Peggy June Pierson was born on July 18, 1948 in Nebraska City, NE, the second of seven children born to Willard Betts and Fern McConaha. She attended school in the town of Julian, NE. 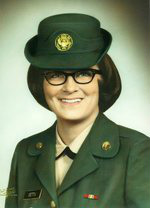 At age 18, she proudly joined the US Army serving in the Women's Army Corps. Peggy met William "Bill" Pierson on base at Ft. Gordon, GA and the two married in 1971. They settled in Bonner Springs, KS in 1973 where they happily raised their family. She worked for many years as an instrument technician at Shawnee Mission Medical Ctr. before retiring in 2011. Peggy was preceded in death by her parents and by siblings Jim, Billy and Sally. She is survived by her husband, children Carley Massing and husband Toby Massing, Alice Pierson and partner Jack Granath, siblings Ray Betts, Danny Betts and Lin Betts and grandchildren Ellie and Jake Massing. Peggy was a kind and beautiful soul who will be greatly missed. A celebration of her life will be 2:00 p.m. Saturday April 19th at the Alden-Harrington Funeral Home. Private burial of her cremated remains will follow at a later date. The family will receive friends at a visitation one hour prior to the service also at the funeral home. In lieu of flowers the family suggests memorial contributions to Gilda's Club Kansas City, a support resource for cancer patients and families.